NATURAL as that sun-kissed hair of your youth. No one wants to be weighed down by blocky color. Marie’s processes, whether Balayage or foil, encompass the best in hair color techniques. No more stripy, chunky highlights. As a true artist, she takes skin tone, eye color and your input into account in order to create. Marie’s philosophy of hair coloring is one of natural looking, healthy hair. So whether you want to be a sultry brunette or a radiant redhead or one of our believable blonde shades you can be assured that your hair will always be in the optimum condition. Changing your hair from a mousy brown or an aging gray to a soft appealing shade can make a definite change in your outlook. Suddenly you feel more attractive, desirable. Changing one's hair color has helped many of our clients make positive changes in their lifestyle. A complete change may not be for you. You may have perfectly lovely natural hair color, Marie can enhance your natural hair color with an infinite number of exciting, color flattering effects. She is absolutely sure of her hair coloring, because her methods of determining the final color are unique. The most important factor that the hair color artist (Marie) has to consider is determining which hair color is just right for you. Like selecting a hairstyle, the hair colorist must consider many factors when selecting a hair color. The hair color must blend well with your complexion. Too little contrast and you will look washed out. Too much contrast and the hair color can look too hard and unattractive. Your hair should frame your face in a medium contrast. The hair needs to be either slightly lighter or slightly darker. Other factors are your age, the length of hair, lifestyle, whether you plan to perm, the amount of gray hair and your natural hair color category. Anyone can color hair, all you have to do is go to the drug store or the supermarket, purchase a bottle of hair color, read the directions, mix the color, apply it to your hair, shampoo it off and, like magic, you have just the color you've always wanted to be...Right?...Wrong. Hair coloring is far more complex. It is an exact science. To be a hair colorist, you need the skill and understanding of chemistry, and have the creativity to select just the right shade desired. 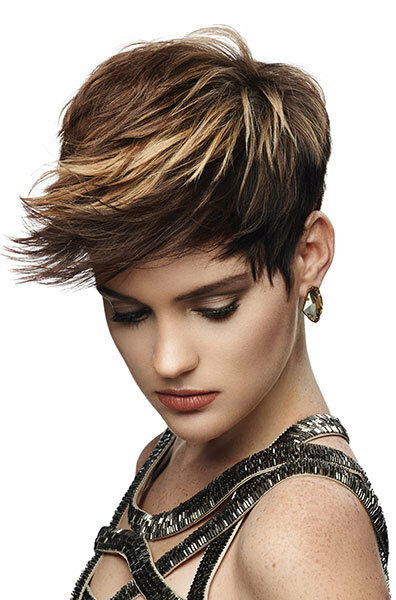 Couple this with the patience to select hundreds of tiny strands placed in just the right areas of the head to be lightened, and you can understand that today's hair colorist is a skilled specialist. If you are one of those unlucky ones who has found out the hard way that all hair salons cannot color hair, or if you use the same color on your hair that your neighbor uses and it doesn't come out the same, or the first time you colored your hair, it was perfect and now it is much less than perfect, you've learned that hair coloring is a bit more complex than the TV commercials would have you believe. Regardless of whether the final outcome is shades of jade green or a crystal-cool blonde, there’s a fine art to Color Melting and the top “melters” in the business have fine-tuned a few important techniques for successful outcomes. For example, Marie Venter will brush on the first, darkest color with a flat hair color brush, then turn the brush on its side and stretch the color downward, forming feathery little strokes. She will than leave a space, brush on the next color, flip the brush on its side and blend the first and second colors together. Once all of the color is brushed on, Marie will also get in there with their fingers and smudge and smoosh the colors together to ensure everything is blended together with no visible lines. Another Color Melt secret weapon is to use bonding product during the coloring service. It’s added directly into the color formula being used to keep the integrity of the hair intact during every step of the color process. Using a bonder prevents bond breakage during chemical hair process and protects the bonds over time. By painting a few select top layer pieces of hair by using two different volume lifting creams." This creates "a beach-y look that is naturally sun-kissed with dimension and depth. Pintura is somewhat similar to Balayage, which is also hand-painting color on hair. But there are some important differences between the two. Pintura is painted curl-by-curl, where Balayage slices out sections for highlight/lowlight without regard to texture or shape. Balayage color saturates the entire hair strand (front to back), whereas the color just sits on top of 2/3 of the hair shaft with Pintura ... creating that famous "ribbon of light" effect. The end results are quite different, with Pintura being much more dramatic and visible on curly hair than Balayage (which sort of disappears into the curl pattern). Dimensional hair coloring, the play of soft lights...gentle shadings or dramatic accents streaming through your hair; nature doesn't color hair in one solid dimension. Healthy, young natural hair almost always has variations of color, highlights or shadings running through it. It is these shimmering nuances of color that give hair special radiance and beauty. Marie uses the very latest professional hair coloring techniques to place the highlights just where you need them. Her techniques allow you to get closer to your scalp, which means less frequent retouching. Remember when you were younger and you had the time to spend in the sun? Soft highlights will do the same thing to your hair. By isolating small sections of hair and using a gentle lightener on those sections, you create an effect that looks exactly like the sun did it. No one will ever know! Marie will start with natural dark hair or hair that has been colored; then she will add streams of caramel and amber shades. The result is a beautiful blend of colors that will enhance any hairstyle. It is truly a beautiful effect. Redheads have always been special, because they make up such a small percentage of the world population. Redheads create a challenge. It takes special skills to maintain a beautiful red shade. So if you have a yearning to brighten up and draw attention to yourself, becoming a redhead will do it for you. Marie is a great hair colorists and has learned to master the red shades, so if you are looking for a flaming titian, a delicate strawberry or a deep auburn, Marie has the skill to do it for you. Soft natural reds are Marie’s most popular redheads. There is just enough red tones to be a standout but not so red to be defiant. Come in and try it on. You'll love it! Marie is a hair colorists and has a special way of creating the most dramatic reds available. By first lightening streaks of hair blonde, then putting a red tone over the entire head of hair, you get a beautiful dimensional effect. This is a look that will turn heads. You can remove just some of your gray hair without making a total commitment. It requires coloring only portions of the hair to match your existing natural hair color. This technique is the favorite to those that do not want anyone to notice that their hair was colored. Hair color is accomplished in the same manner as tone on tone. Using a slightly darker hair color, cover the gray hair. Add to the hair, streaks of caramel colored highlights. This is a truly beautiful effect for someone with graying hair. Ombre is a French word that literally means shaded; think gradient color, like you'd see on a swatch of fabric or skein of yarn. Ombre is a hot trend in Hair Color this year-and with good reason! Nothing is more low maintenance than not coloring your hair, but comparatively speaking, Ombre is a fairly easy hair color look to keep up (presuming you go from darker roots to lighter ends). For the least maintenance, go as close to your natural hair color as possible near your roots, then gradually go lighter down the hair shaft. Ombre hair coloring actually mimics the hair color of our childhoods. Remember when you'd get so much sun in the summer that your hair would lighten dramatically? Then, by mid-winter, you'd have that Ombre look...naturally. Presuming your natural hair color isn't gray; Ombre hair color looks very youthful. Given that the whole point of the effect is to make it look on purpose like you're growing out your roots. Ombre actually makes dialing down your hair-coloring budget while retaining some of that expensive lighter color stylish.